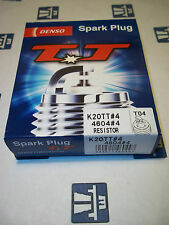 Denso Part Number - ZXU20PR11. 4X GENUINE SUZUKI Spark Plugs. Fits all petrol models of Suzuki SPLASH. Made by Denso. 46 F10D; F10DN 09/04-12/08 XU22EPR-U XU22TT 4. SUZUKI ALTO IV 1.1. SUZUKI ALTO IV (02-08). FIAT 500 (C) (312) (07-). DAEWOO GENTRA (13-). SUZUKI WAGON R (98-00). CHEVROLET COBALT (11-). CHEVROLET SPIN (12-). 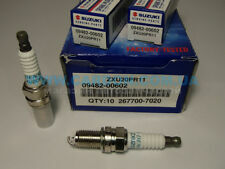 Model: SUZUKI ALTO V. Set of 3 PureSpark Iridium (Iridium centre Electrode) Spark Plugs. With its iridium center electrode this spark plug will match most other Iridium spark plugs available while still at an affordable price. Type:- SILFR6A11. SX4 1.6 M16A VVT / (118bhp) 26.5mm Reach Plugs 12/09 –>. GRAND VITARA 2.4 J24B 10/08 –>. IMPREZA (07-->) 2.0 EJ20 / NON TURBO 05/07 –>. SWIFT 1.6 M16A 10/11 –>. SEDICI 1.6 M16A / (118bhp) 26.5mm Reach Plugs 11/09 –>. Esté al día con NGKIRIDIO IX Las bujías de encendido. La excelente capacidad de encendido de NGK Iridium IX bujías proporciona una alta eficiencia de combustión, lo que resulta en más millas por galón. Bosch Type :- FR7DC Part number :- 0242235666 Short number :- 8. Vitara 1.6i 16V G16B 07/1990 - 03/1998 71 kW. Vitara 1.6i 16V G16B 03/1995 - 03/1998 71 kW. Vitara 1.6i 16V G16B 02/1991 - 03/1998 70 kW. Engine Code: F10DN; Model year to: 12/2006. SUZUKI ALTO (FF) 1.1 (RF410) Hatchback Petrol 09/2004 12/2008 FWD 16 63 46. Thread Pitch 1.25 mm. Spark Position 4 mm. Function Spark Plug. Outer thread 12 mm. Suzuki Ignis 1.5 Sport Suv mk2 [2003-2006]. Model: Ignis. Plug Type: TT Twin Tip. 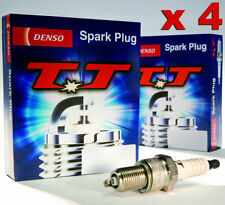 DENSO SPARK PLUGS X 4. 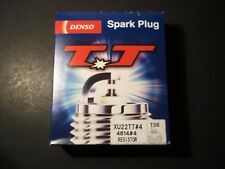 DENSO 4604 SPARK PLUGS. Bodystyle: SUV. Make: Suzuki. Plug Code: K20TT. GRAND VITARA (-->09/05) 2.0 J20 10/00 –>09/05. GRAND VITARA (-->09/05) 2.5 H25 10/00 –> 02. GRAND VITARA (-->09/05) 2.5 H25 08/04 –>09/05. GRAND VITARA (-->09/05) 2.7 H27A 09/01 –>09/05. GRAND VITARA (09/05-->) 2.0 J20A 09/05 –>. NGK Part Number - ILZKR7D8. Fits all petrol models of Suzuki Vitara 2014-ONWARDS. 4X GENUINE SUZUKI Spark Plugs. Made by NGK. Manufacturer Part Number: IFR6J11. Engine Type: M13A 1328cc. Model: JIMNY. NGK SPARK PLUGS FOR CARS > NGK LASER IRIDIUM SPARK PLUGS. Product Version: LASER IRIDIUM. Centre Electrode Material: IRIDIUM. Suzuki Jimny 1.3i 16v, 4x4, 4WD (engine = G13A, M13A) = models from year 1998 to 2018. This Sale is for 4x "BE1H10-10-WC" High Performance Plasma Core Upgrade Spark Plugs. (fitted with 14x19mm threaded spark plugs). 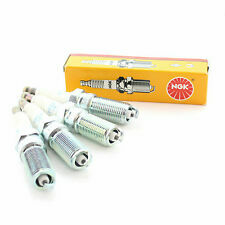 This Sale is for 4x "DR15YS-10-WC" Brisk Silver Single Point YS Spark Plugs. Suzuki APV 1.6i (engine = G16A - 1590cc - 68kw) = models from year 2005 to 2018. (fitted with 14x19mm threaded spark plugs). Specifico per: SUZUKI SJ 410 1.0 33 kW MOTORE F10A 82-85. Le candele d’accensione a marchio NGK sono sinonimo di qualità, affidabilità e durata nel tempo. L'INSERZIONE SI RIFERISCE ALL'ACQUISTIO DI QUATTRO (4) CANDELE. 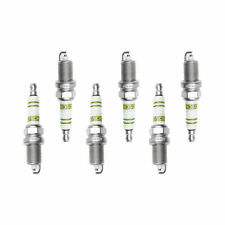 This Sale is for 4x "LR17YS-9-NC" Brisk Silver Single Point YS Spark Plugs. Suzuki SJ413 1.3 (G13A,G13B) = models from year 1984 to 1990. (fitted with 14x19mm threaded spark plugs). Specifico per: SUZUKI Swift (C11S)(RS413) 1.3 68 kW MOTORE M13A 05/05-. Le candele d’accensione a marchio NGK sono sinonimo di qualità, affidabilità e durata nel tempo. L'INSERZIONE SI RIFERISCE ALL'ACQUISTIO DI QUATTRO (4) CANDELE. Specifico per: SUZUKI Swift Sport (RS416) 1.6 92 kW MOTORE M16A VVT 01/07-. Le candele d’accensione a marchio NGK sono sinonimo di qualità, affidabilità e durata nel tempo. L'INSERZIONE SI RIFERISCE ALL'ACQUISTIO DI QUATTRO (4) CANDELE. Manufacturer Part Number: BKR6EIX. Model: JIMNY. NGK SPARK PLUGS FOR CARS > NGK IRIDIUM IX SPARK PLUGS. Product Version: IRIDIUM IX. Centre Electrode Material: IRIDIUM. Product Type: SPARK PLUG. Make: SUZUKI. IFR6J11 7658 X 1 NGK Laser Iridium Bujía SUZUKI SWIFT 1.3 1.5 1.6 etc. SUZUKI SWIFT (04-->) 1.3 4 M13A 04/05--> X. SUZUKI SWIFT (04-->) 1.5 4 M15A 04/05--> X. SUZUKI SWIFT (04-->) 1.6 4 M16A VVT 08/06--> X. SUZUKI 09482-00550. SUZUKI GRAND VITARA (09/05-->) 1.6 4 M16A VVT 09/05--> X. Manufacturer Part Number: BPR5EIX. 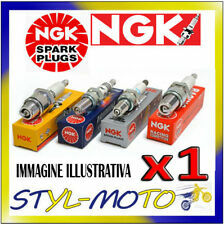 NGK SPARK PLUGS FOR CARS > NGK IRIDIUM IX SPARK PLUGS. Model: SJ413 / SAMURAI. Product Version: IRIDIUM IX. Centre Electrode Material: IRIDIUM. Product Type: SPARK PLUG. NGK Part Number - IFR6J11. Made by NGK. 4X GENUINE SUZUKI Spark Plugs. Fits all petrol models of Suzuki from 2000-2011. Suzuki Baleno 1.8i 16v & GT, GTX, 4x4 (engine = 89kw) = models from year 1995 to 2002. 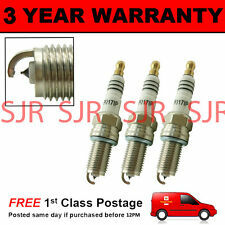 This Sale is for 4x "DOR15LGS-WC" High Performance Silver Multipoint LGS Spark Plugs. Brisk Special Silver LGS Premium Spark Plugs = No Gaping Ready to Fit. Specifico per: SUZUKI Grand Vitara (JB420) 2.0 103 kW MOTORE J20A 09/05-. Le candele d’accensione a marchio NGK sono sinonimo di qualità, affidabilità e durata nel tempo. L'INSERZIONE SI RIFERISCE ALL'ACQUISTIO DI QUATTRO (4) CANDELE. NGK Part Number - SILIFR6A11. 4X GENUINE SUZUKI Spark Plugs. Made by NGK.